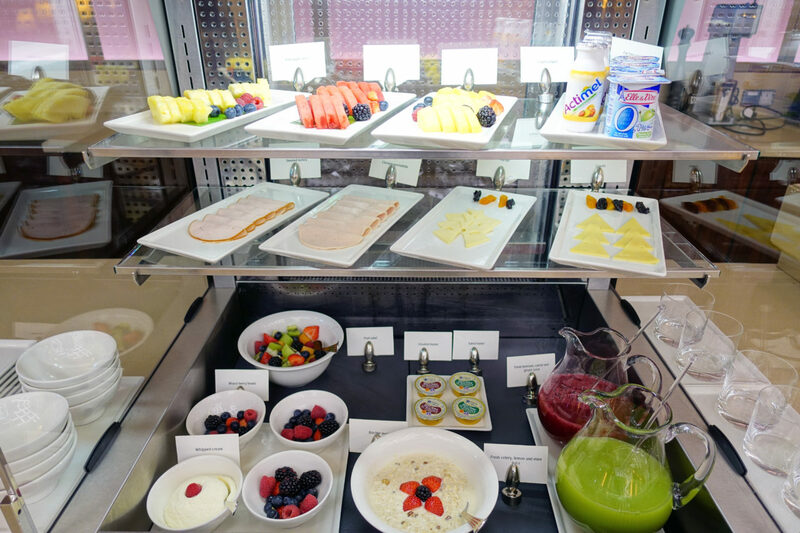 A while back, I’ve shared my review on the Emirates Business Class Lounge at Dubai Airport which has become a top content piece on my blog. 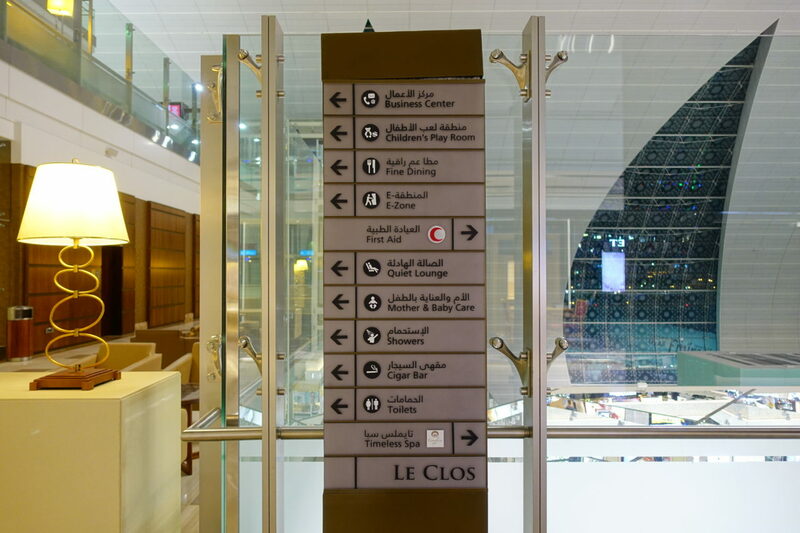 Through a funny coincidence, I was fortunate to spend a long layover in the Emirates First Class Lounge in Dubai lately. 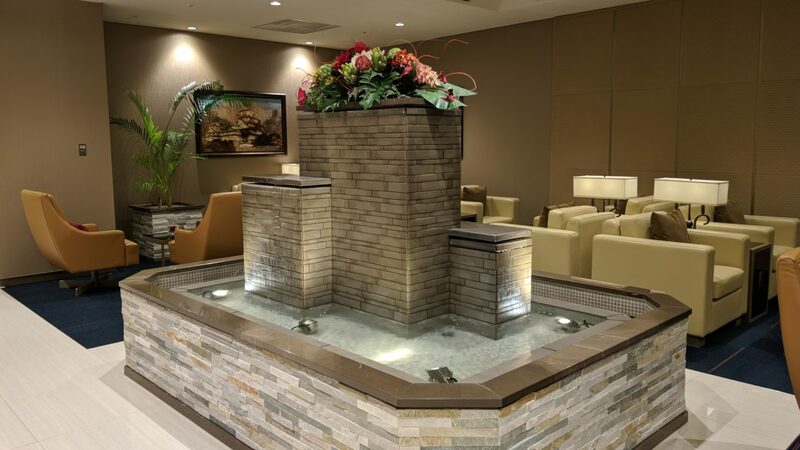 While I’ve stated back then that “the business class lounge almost feels like an own terminal”, the first class lounge is an own terminal with more perks then you’ll ever need. 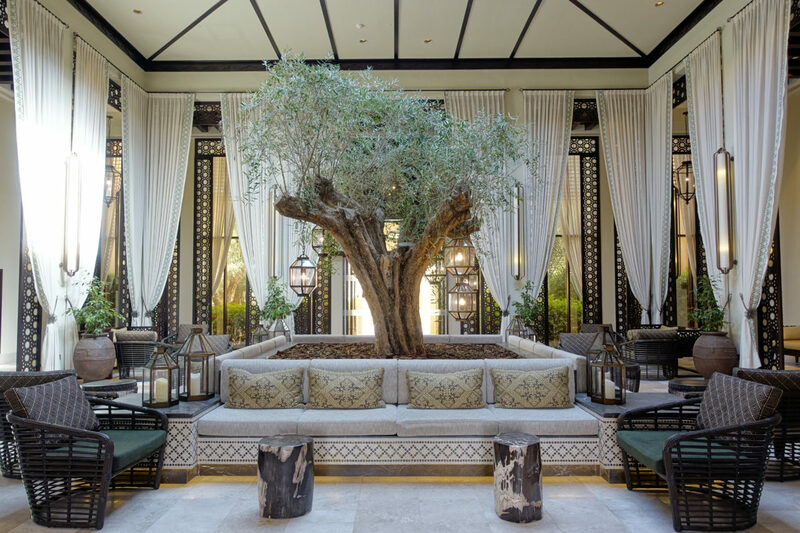 Read on to get a peek inside one of the most luxurious airport lounges of the world. The business class lounge I’ve been staying in often so far is located in the B concourse while I now was able to visit the first class lounge in the A concourse. Upon passing through security there are several elevators that will lead you to the center point of the floor. 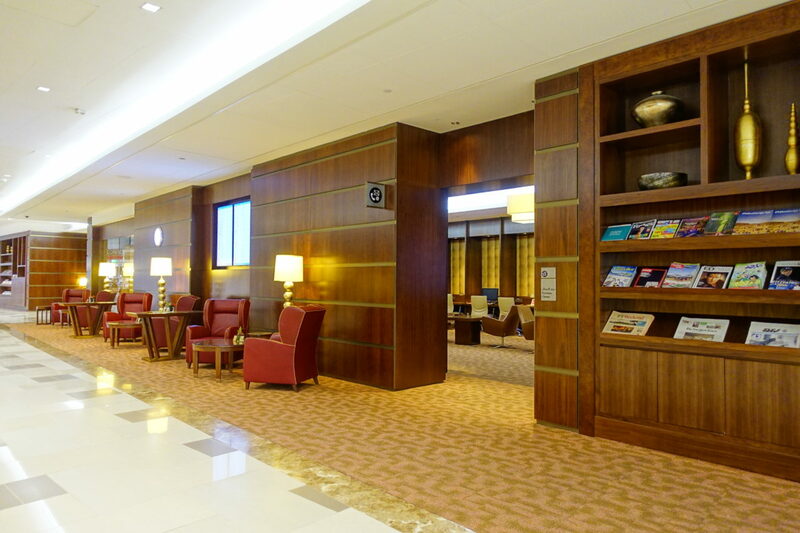 The Emirates first class lounge is located in the third floor of the terminal while the business class lounge is located on the fourth floor. Entry at one of the eight counters was quick and because it was very “early at night”, I was basically the only (!) person to stay on more than 10.000m² which is a weird thought. The lounge spawns to your left and to your right with basically the same features in either direction. 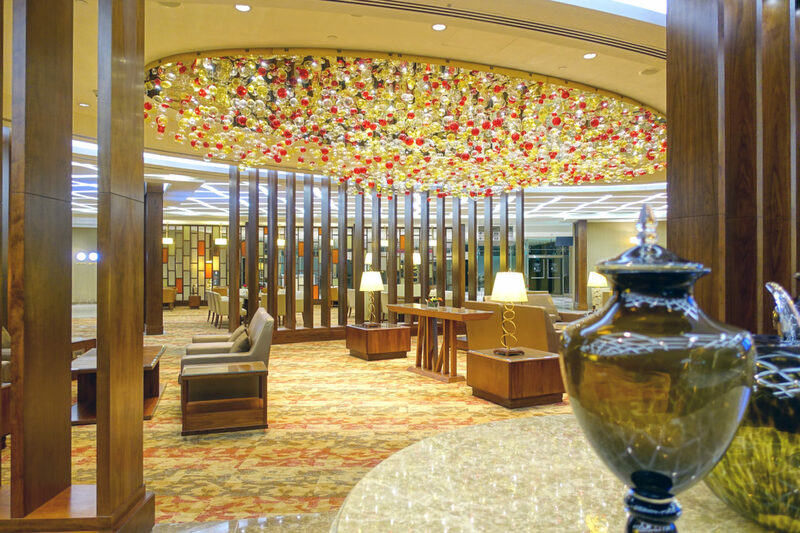 This is just one wing of the massive first class lounge as viewn from the center. The First Class lounge is huge. Like really huge. And I felt like Tom Hanks spending a night at the airport. The guide depicts some of the main features and where to find them. The sheer size of the floor is ridicolous. The business class lounge was large already, but here it took me almost 10 minutes to walk from one end to the other. There are couches, chairs, sofas, tables, loungers everywhere. It must have been 300 seats – the least. 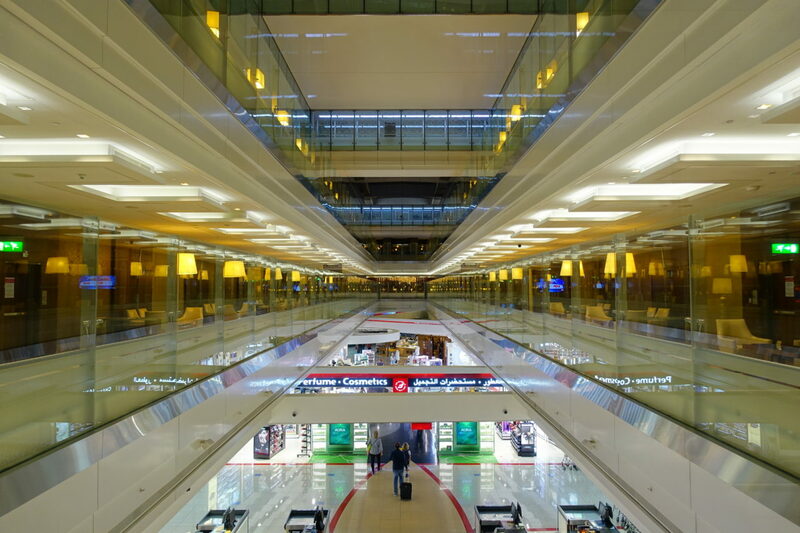 The impression of an own terminal is amplified by a dedicated duty free shopping area inside the lounge that is exclusively for first class customers. It’s like a (very private) department store inside the lounge! 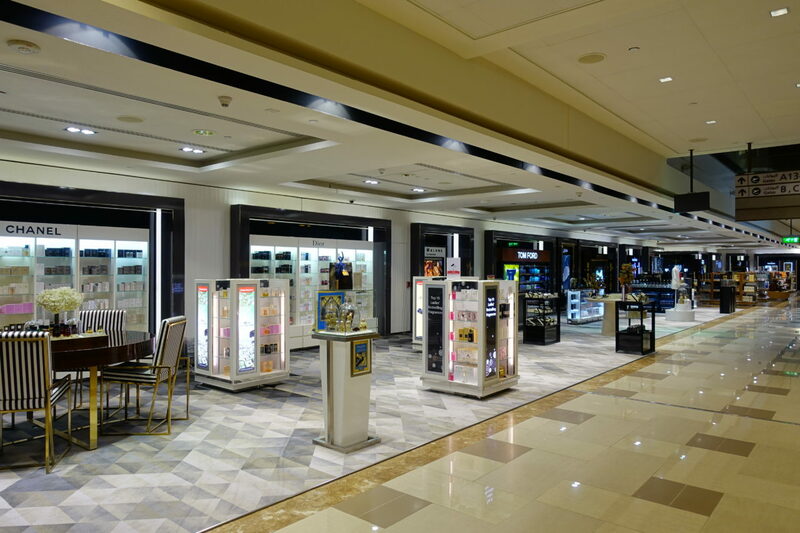 I found a dedicated duty free department store inside the lounge. Fancy some Tiffany diamonds before flying? 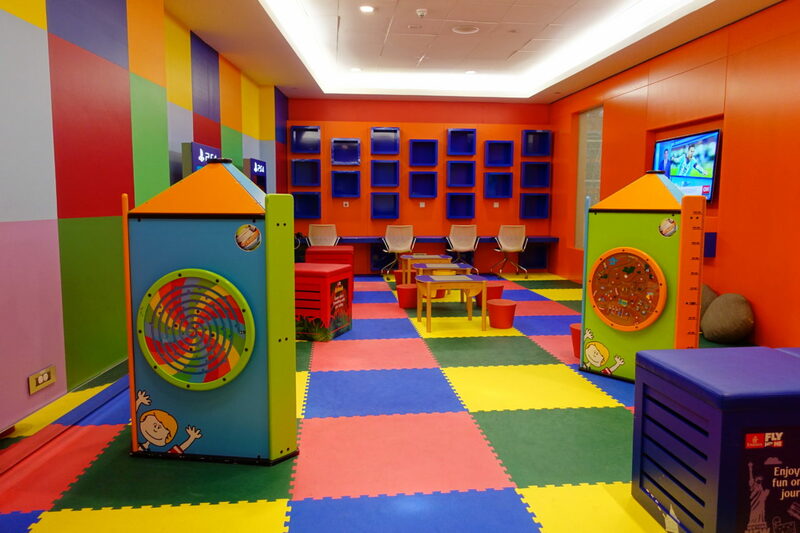 Emirates provides dedicated kids areas with TVs, PS4 and toys to their first class customers. Charging stations allow to safely recharge your gadgets and the biggest selection of newspapers and magazines is yours for taking. Needless to say, you can board your plane directly from the lounge, all gates to upper deck boarding are directly accessible. 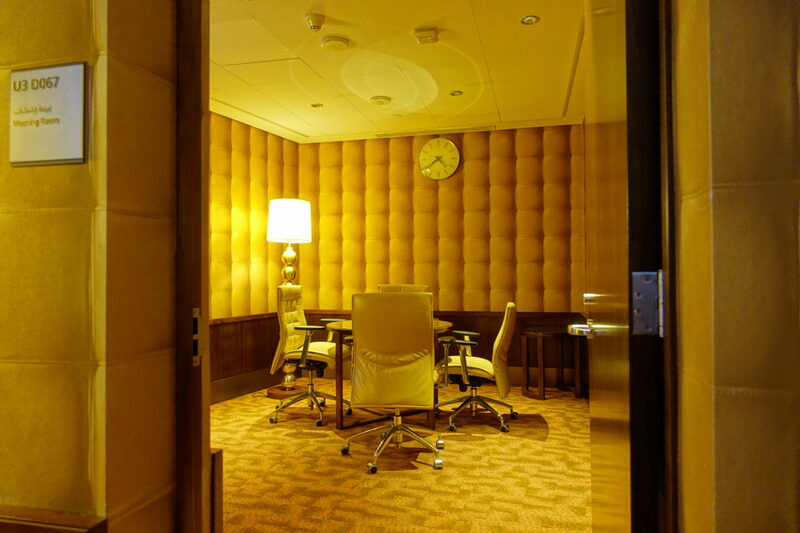 The business center has full office facilities and even proper meeting rooms! 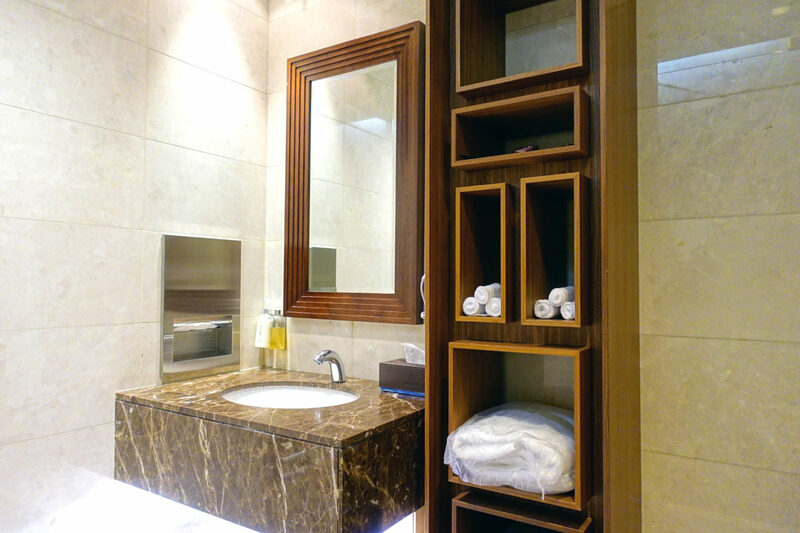 I counted 8 large and clean washrooms which were absolutely spotless just like the shower facilities. 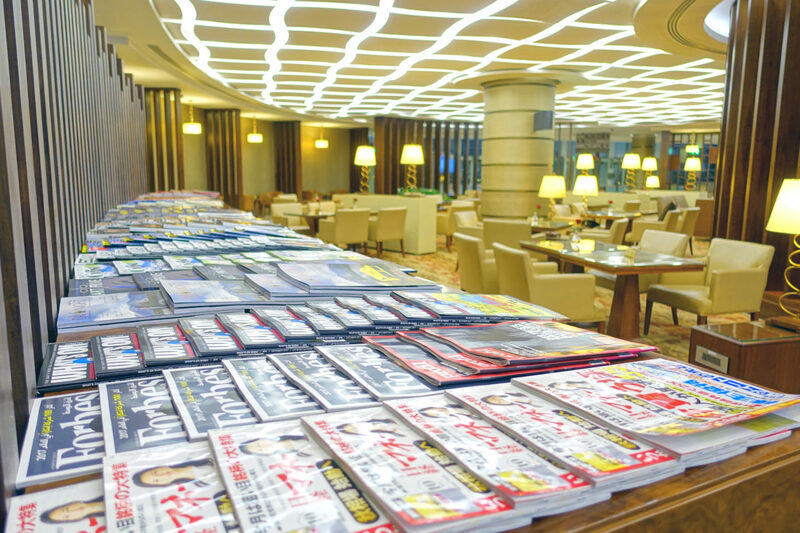 A library-style selection of fresh newspapers and magazines shortened my waiting time. One of the many dining areas near a buffet station with plenty of room to relax or work. The whole place was also not crowded at all. 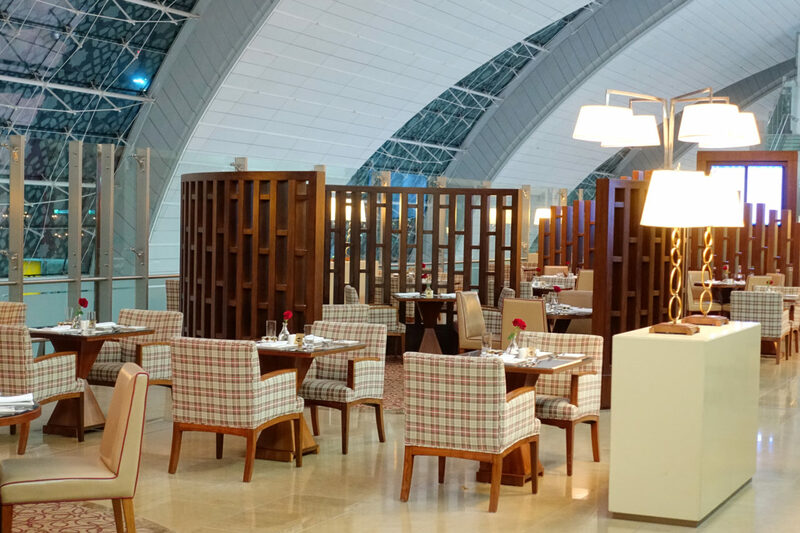 The business class lounge can become a little busy when all incoming flights have arrived at DXB but the first class lounge feeled like a quiet grand hotel all the time. I would have loved spending time here when I was a kid. TV, games, toys and PS4 do make travel with children more of a joy. 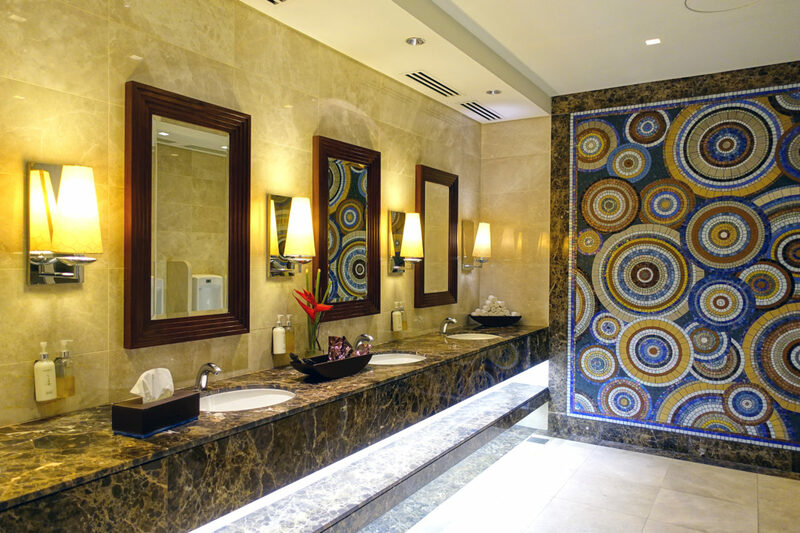 The business facilities were among the best I’ve ever seen. Stay productive all the time, there are even full featured meeting rooms you can use complimentary. Coffee stations are spread throughout the seatings areas and the espresso is actually very good. 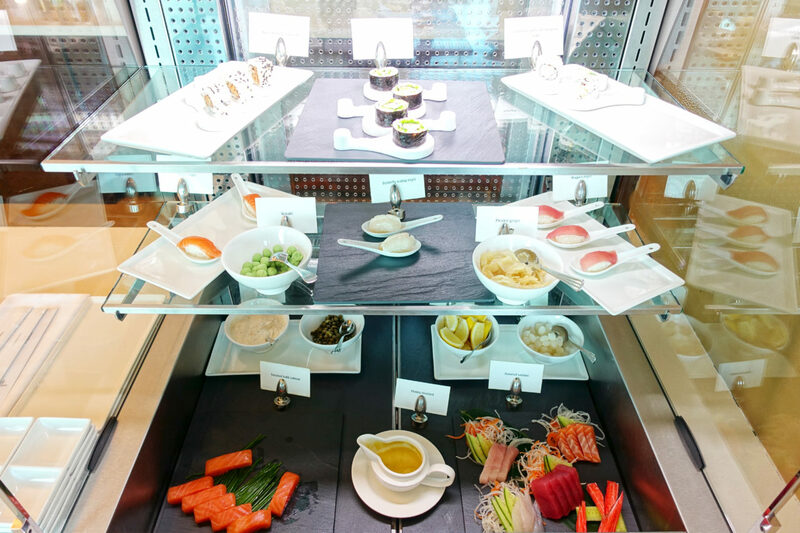 You will find several buffet food stations with bars just like in the business class lounge. A decent selection of cold cuts, fruits, joghurts, appetizers, vegetables, fresh juices and large selection of bread is always available. Several international dishes are offered on top. I even spotted a very proper sushi and sashimi station which I unfortunately could not try that early in the morning. The difference is, as soon as I approached the buffets a member of staff would either carry my choice to my table or recommend me the “proper option” if I wanted “more selection”. One of the many buffet stations if you don’t go for the fine dining option. 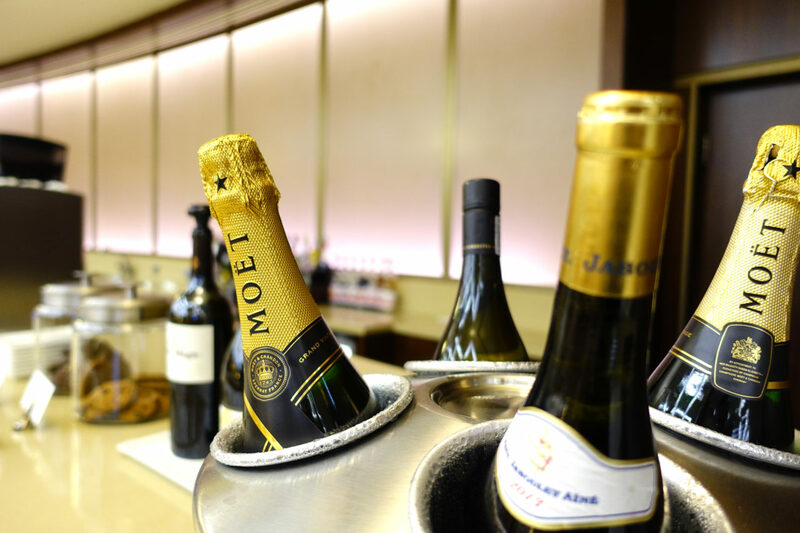 Full bar & champagne selection with fresh bottles all the time – or because it was 4am! Proper in the sense that two (!) 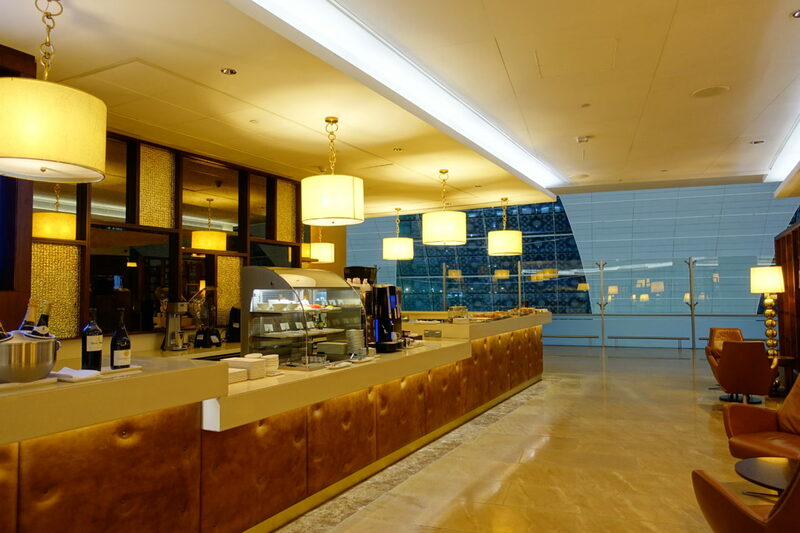 full fine dining restaurants are located inside the first class lounge with table service and full made to order meals. 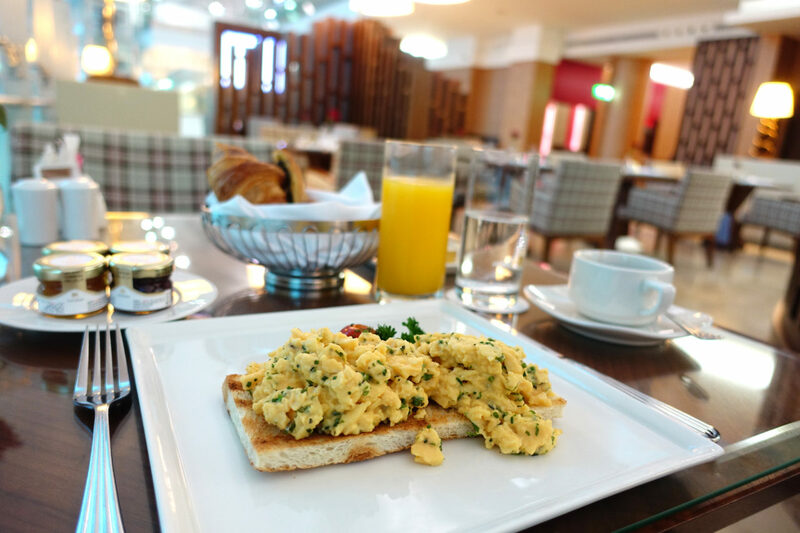 Before boarding, I had a delicious breakfast with a Bircher Muesli, bowl of fresh fruit, orange juice, coffee and a yummy scrambled egg with frehs herbs alongside some croissants. While that might seem nothing special compared to the business class lounge although here, the real deal is lunch and dinner. Vietnamese summer rolls, Octopus Carpaccio, Foie Gras Terrine, Gnocchi, US Prime Beef, Salmon Filet or even roasted duck. Fantastic looking dishes and all are frehsly prepared in the open kitchen by the chefs. A fine dining restaurant is yours for breakfast, lunch and dinner, served at your table with any drink you can imagine. 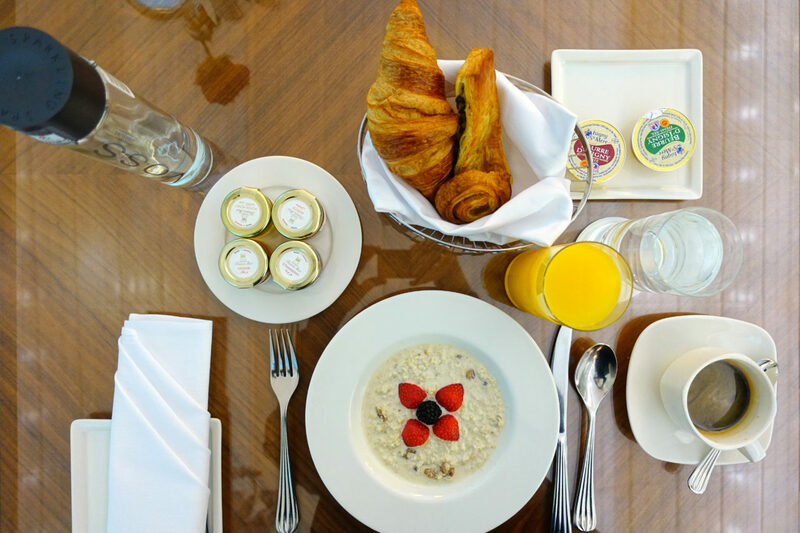 My breakfast was a healthy choice of fresh Bircher muesli, freshly squeezed juice and warm croissants. Second course of the a la carte breakfast were fresh scrambled eggs with herbs. Even though it was 4am, the lounge was staffed with friendly, helpful and smiling associates that would greet me every time. Whenever somebody took something it would be replaced instantly. The service was attentive and always checked whether I needed help. They were escorting me every time to make sure that I found my way – to the restroom, showers, Spa, restaurant, gate. The attendants would occasionally check if your departure gate changed which was a nice touch. I think the guest/staff ratio was probably 1:1 – stunning. One topic that I want to cover in greater detail is the quiet lounge / sleeping area. The business class lounge is really good but I had trouble catching proper sleep there – although I have been *really* tired. 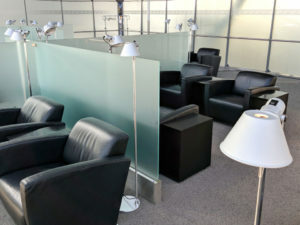 Blankets, socks and eye shades are provided in the business class lounge too but the noise level (those TVs!) and comfort of the loungers to rest on was nothing compared to those area at the first class lounge. The quiet area is tucked away in dedicated, isolated rooms for starters. It’s still not proper beds but each “pod” offers really good privacy and a pillow is added on top the blanket, socks and shades for additional comfort. Water is waiting at the side on a table. The loungers are considerably longer and allow for sleeping in a more natural position. As you would expect by now, almost all loungers were still available for the taking. 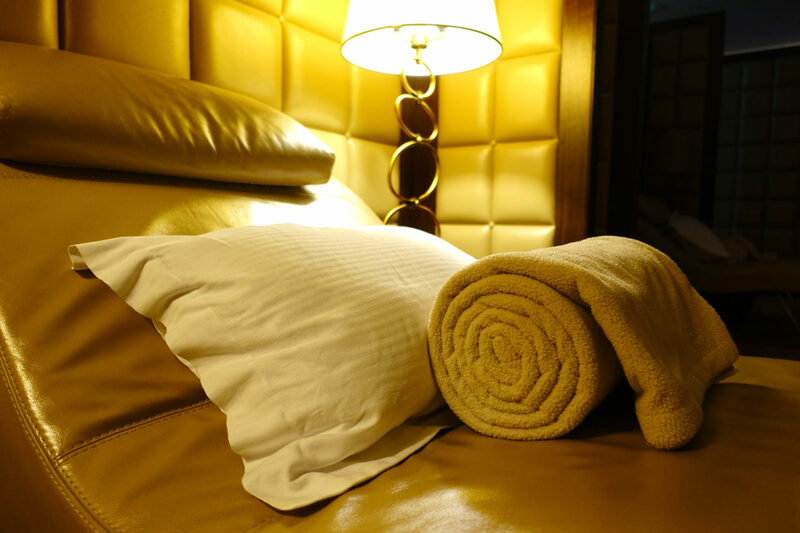 Spend some hours of proper sleep in the quiet lounge – pillows, blankets, eye shades and water are provided at every cubicle. The lounger is a lot longer than in business class lounge and allows for a more natural sleeping position. Front-desk of the showers in the lounge, I had no waiting time and friendly attendants. My shower suite was like a mini Spa all to myself and had no (visible) time limit. 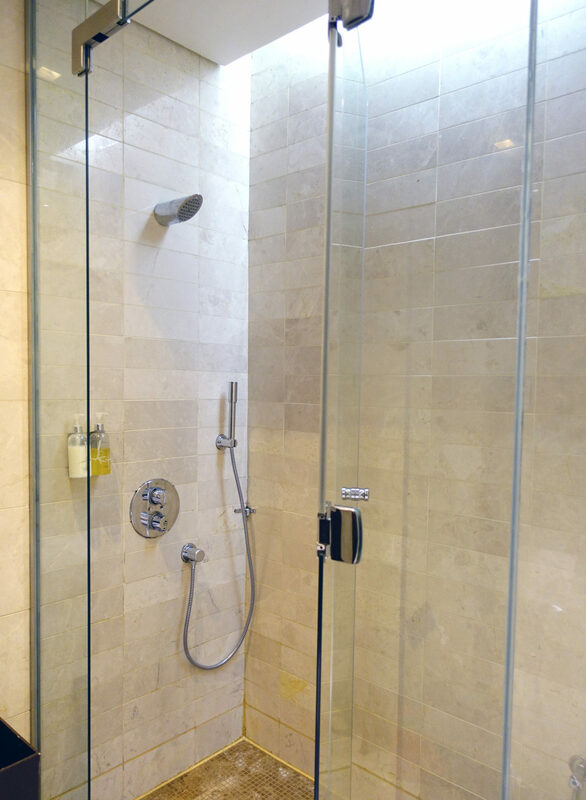 My walk-in shower was spacious, clean and modern. Pressure was mediocre though. 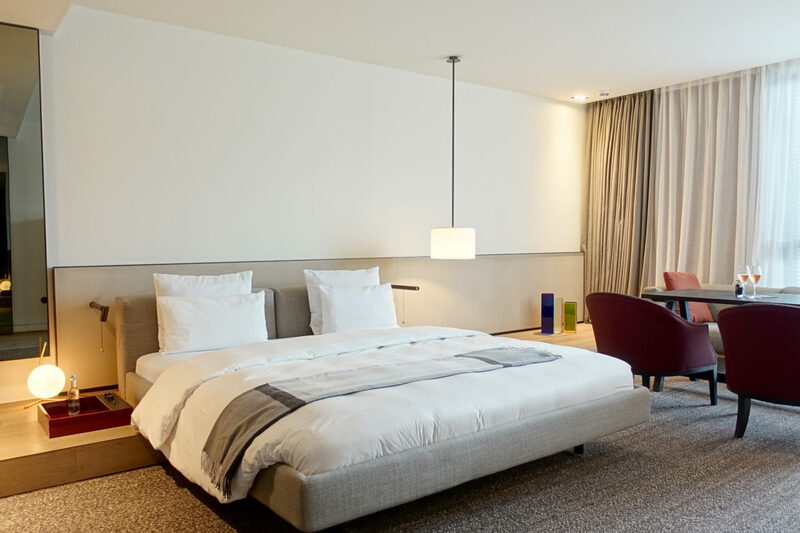 Everything was spotless, clean and tidy and better than in some of the hotel rooms I’ve stayed in. To sum up I have to admit, you ‘really* feel refreshed taking a proper shower and spending some time just for you on a 18 hours journey. Let’s face it – I loved the lounge. But in all honesty I think that format of a lounge is not reasonable in any way. 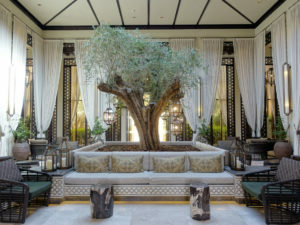 It’s UAE opulence. 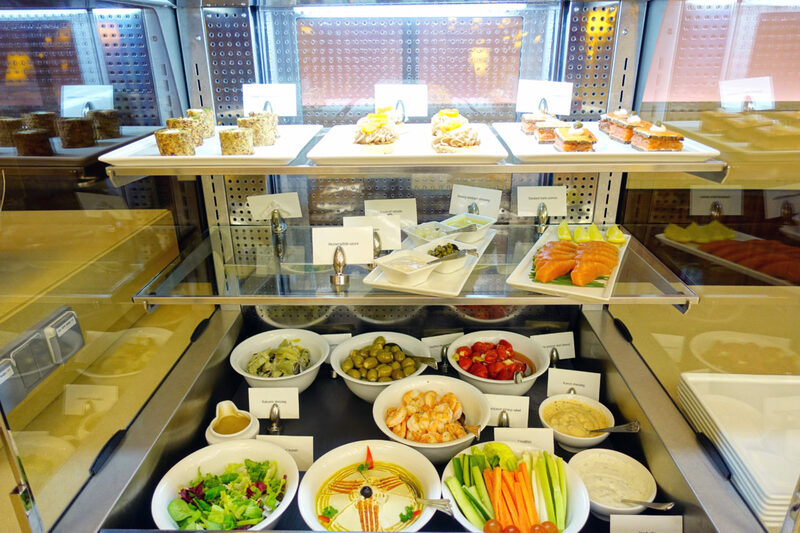 The Emirates business class lounge already is a blue print of how travel is meant to be and is hard to beat. 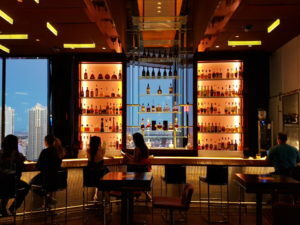 My feeling was that many of the perks such as the duty free area and the cigar room (!) exist because there’s not much left to differentiate with. The size alone is plain prestige. The fine dining restaurant is a real treat and I would definitely prefer it over airplane food. But do you need it compared to buffet stations? 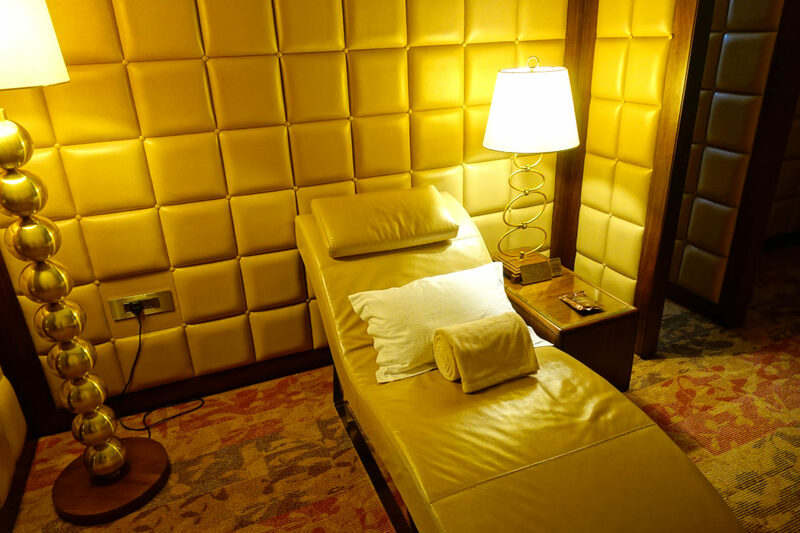 The striking perk is the sleeping rooms, they’re the worldwide best I’ve ever witnessed. 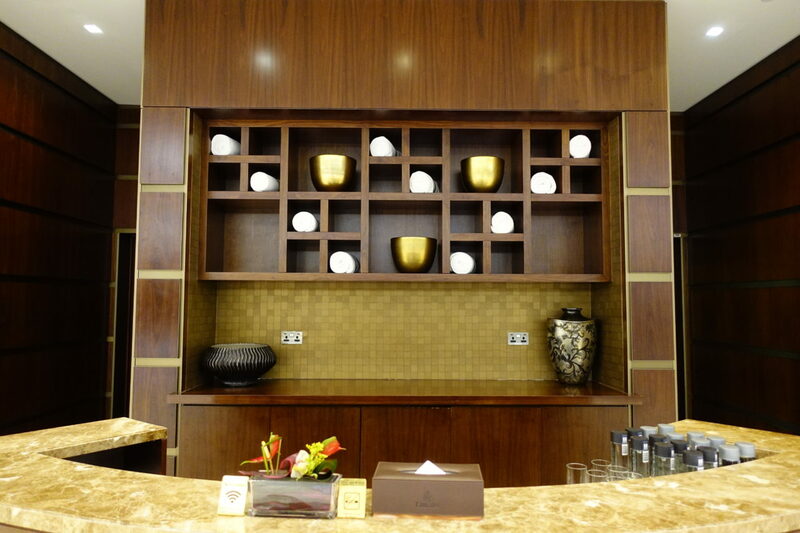 The Emirates First Class lounge is a fantastic experience. Should you ever have the opportunity to try it – go for it. What is your favourite lounge? Let me know in the comments! 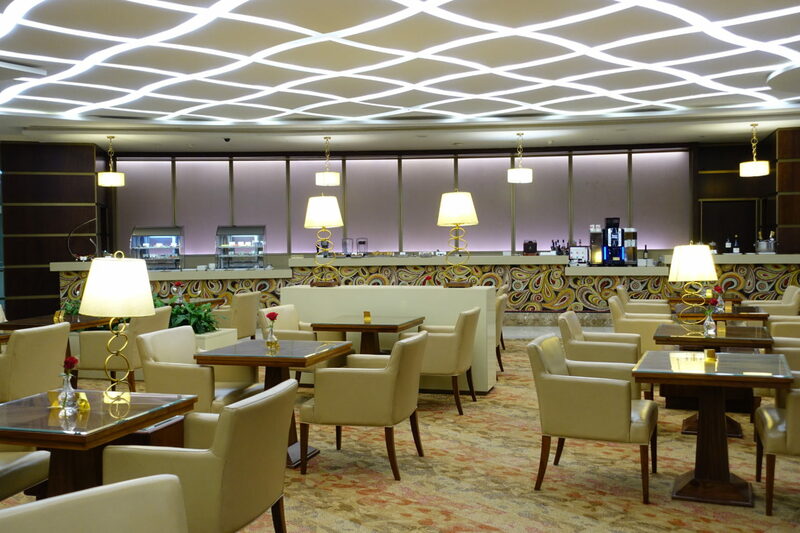 Like to check the cheapest Emirates fares to experience the first or business class lounge on your next flight? 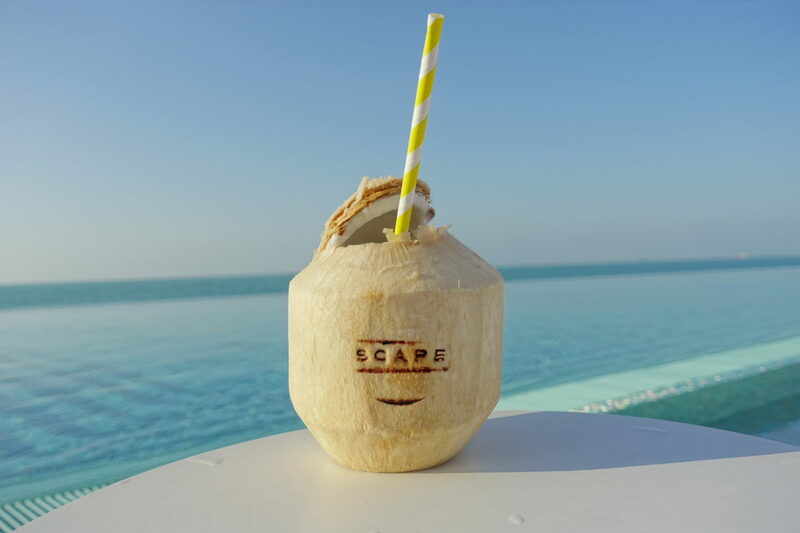 Also, check my review on actually flying with Emirates Business Class and my top Dubai restaurants.